1 Cook sausage in 12-inch nonstick skillet over medium-high heat 4 minutes or until cooked. Remove sausage to paper-towel-lined plate. 2 Season chicken, if desired, with salt and pepper. Cook chicken in same skillet, stirring occasionally, 4 minutes or until chicken is thoroughly cooked. Remove chicken from skillet and set aside. 3 Stir red peppers and onion into same skillet* and cook, stirring occasionally, 4 minutes or until tender. Stir in garlic and cook, 30 seconds. Stir in broth and Hellmann's® or Best Foods® Real Mayonnaise. Bring just to a boil over high heat. Reduce heat to low and simmer 1 minute. 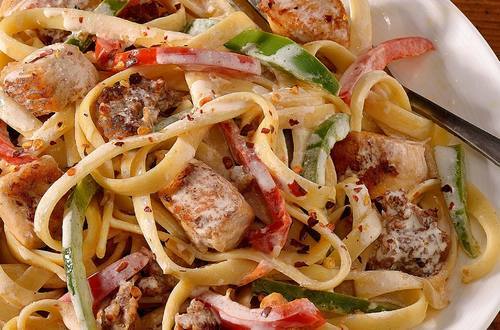 Stir in fettuccine, chicken and sausage and cook, stirring occasionally, 1 minute or until heated through. Season, if desired, with salt, pepper and crushed red pepper flakes. *Add 1 tablespoon olive oil, if needed, to cook vegetables.